The 80’s hairband evolution spawned a number of groups that were the epitome of party rock, had catchy riffs and fun beats. TRIXTER was one of those bands. Vocalist Pete Loran, bassist PJ Farley, Drummer Mark ‘Gus’ Scott and guitarist Steve Brown were instant heartthrobs and they appealed to a diverse audience. Music media capitalized on the age of the band members because they were a tad younger than the average band on the road, and this revelation didn’t hurt their chances for fame. “Give It To Me Good” was an instant hit and was given heavy rotation on MTV and rock radio. Follow up singles like “Surrender” and “One In A Million” gained just as much popularity and garnered the band a coveted spot on WARRANT’s Blood, Sweat And Beers Tour. The tour featured TRIXTER and fellow superstars FIREHOUSE as the show openers, and even today, these three bands are featured together at one off shows and festivals. It was a daring package and was sold out for most of it’s run through 1991-1992. 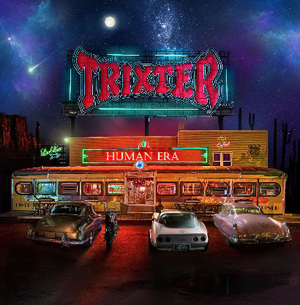 TRIXTER’s self-titled debut and it’s follow up album, Hear, produced some of the finest hard rock of the era and they were, unfortunately, forgotten by the media after that heyday. The grunge revolution threw many good bands off course and some didn’t recover until such a huge demand for their music ensued in this decade. It is to the extreme pleasure of many fans that TRIXTER has resurfaced. In 2012 the band released New Audio Machine and now, in 2015, Human Era hits the shelves and it’s a solid record. The band has stayed true to their roots and there is not a bad song on this CD. The album kicks off with the anthemic “Rockin’ To The Edge Of The Night” and barrels through “Crash That Party”, a no-holds-barred tune that easily segways into the softer “Not Like All The Rest”. Loran still has the ability to croon his way into swoon-worthy status and the rhythm section of Farley and Scott is a force to be reckoned with. Brown’s guitar chops have earned him a top spot amongst players of this genre; he was even the guitarist selected to fill in for ailing Vivian Campbell on DEF LEPPARD’s last tour. This is a band that knows what works for them and they stay true to their proven formula. The title track itself has a strong message of loyalty, friendship and longevity; “Human Era” perfectly captures what the band has built over the past three decades. This is a band that was formed in a time before social media, before internet took over the average person’s daily news feed and before handheld devices dominated people’s every waking moment. The chorus of the song sums it up perfectly with the line “Is it any wonder we’re still together, we built this in a human era”. Other standouts on the album include “For You”, “Beats Me Up” and “All Night Long”. As a fan from the beginning of their career, I am not disappointed in this record. Like fine wine, this band only gets better. Give Human Era a listen because it’s worth it. Pre-order your copy of Human Era in the KNAC.COM More Store right HERE.